Should the Flyers Pursue Keith Yandle? 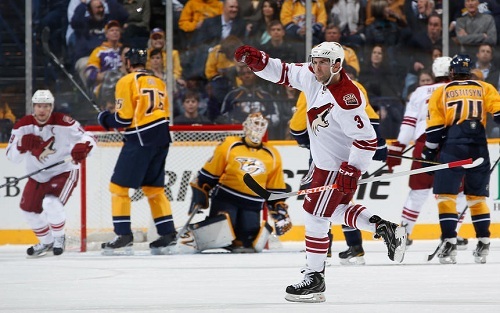 Home/Featured/Should the Flyers Pursue Keith Yandle? With an already talented group of young forwards, the Philadelphia Flyer’s main concerns still revolve around defense. Chris Pronger is unlikely to return and Kimmo Timonen isn’t getting any younger. Luke Schenn proved to be a dominant force last season but the Flyers need an offensive catalyst on the blue line that can help run the power-play. Timonen is 38 years of age and it is very unclear how many more season’s he has left in the tank. The team had the right idea when they signed Shea Weber to that massive offer sheet that was later matched by the Nashville Predators. It is blatantly obvious that defense wins hockey games in this day and age so without a top tier defenseman, the Flyers chances of reclaiming cup glory are looking bleak. Keith Yandle of the Phoenix Coyotes might be the perfect fit for the Flyers organization. The offensive defenseman is a point producing machine and logs heavy minutes on the power-play. In his past three seasons’, he has put up 132 points in 212 games with the Coyotes. In addition, he has put up a remarkable 19 points in 27 playoff games. He’s played every single game for Phoenix in the last four seasons while finishing 17th among all NHL defensemen in total regular-season ice time. It might be hard to conclude that the Coyotes would even be willing to part with this all-star defenseman but there are some possible reasons. Oliver-Ekman-Larsson has developed into a stud defenseman for the Coyotes and even played more minutes than Keith Yandle last season. The young Larsson was only six points short of matching Yandle’s point production from last season. Larsson was a plus five last season while Yandle was a plus four. Larsson spent heavy time on the power-play last season as he averaged 3:40 of ice time per game with the man advantage. It is clear that Phoenix is willing to move forward with Larsson as the future quarterback of their power-play. The question now remains of how the Flyers can suit the needs of the Coyotes organization. It is pretty simple. The Flyers have lots of offense and Phoenix doesn’t. Phoenix was 21st last year in goals scored and Keith Yandle was their leading scorer. A defenseman led the Phoenix Coyotes in scoring. Their next to scorer was Radim Vrbata with 28 points. This team needs some elite talent up front or they won’t be getting back into the playoffs anytime soon. Shane Doan is a heart and soul player but his point production is going down and he isn’t getting any younger. The Coyotes could use a young star forward from Philadelphia such as Sean Couturier or Brayden Schenn. It is highly unclear though what pieces of their team the Flyers are willing to part ways with. Is it worth it to trade a young star forward for an elite defenseman? It may be a tough gamble but the NHL has changed and a team needs to be good defensively to do great things. The Pittsburgh Penguins are proof that a team with endless star power up front will still fail if they don’t have the defense side of their game down patched. Yandle will be a highly coveted defenseman this off-season and he won’t come easily. He has a $5.25 million cap hit and three years left on his contract. The Flyers have success against teams like the Penguins because it is all about offense but when it gets to the grit of the playoffs, the Flyers are coming up short because their blue line is significantly lacking. Changes do have to be made this off-season and Yandle would sure help boost a Flyers defense core in desperate need.